These two bite gluten free brownies are a cross between a rich chocolate cake and a brownie, and gone in just two bites! They’re your new go-to GF brownie recipe. What sort of gluten free brownies are these? I used to pine for that deep plastic tub of two-bite brownies that you could find at Whole Foods. Do you know the one? Before going gluten free, I never ever left that store without at least one tub of them. I wasn’t sure if they were brownies or rich cupcakes, but I didn’t care. They were perfect in every way: size, taste, and texture. We were eating gluten free in my house for nearly 10 years before I developed this recipe for two bite gluten free brownies. These are not the super fudgy gluten free brownies we’ve made before. If you try to bake a traditional brownie in the wells of a miniature muffin tin, no matter how fudgy, it will burn. Ask me how I know that! Whether you’re gluten free or not, most likely your history of making brownies involved a brownie mix of some sort. But we can do so much better than that. I’m always happy to when food manufacturers make things available gluten free that they’ve always made available in conventional form. I’m thrilled that tons of companies make packaged gluten free bread and gluten free pasta. And much as I used to love the brownies that are made with a regular boxed mix, I have never tried a boxed mix of gluten free brownies that were even deserving of the name. They’re often gritty, rarely chocolatey enough and just don’t taste, well, like brownies at all. Since there’s no melted chocolate in the batter for this recipe, you could easily combine all the dry ingredients (including the sugars) into a mix. Store it in a sealed container in a cool, dry pantry, then just add the wet ingredients (melted butter, yogurt, eggs and vanilla) and bake. Now, everyone knows how much I bake, so I’m often asked to make brownies for a gathering. Since we have 15 gluten free brownie recipes, I’ll ask what kind of brownies. When no one can choose whether they want cakey brownies, fudgy brownies, blonde brownies or peanut butter brownies, I usually make these two bite brownies. These might look kind of like chocolate muffins. But I promise they’re so much more. If you’re still interested in the boxed mixed type of brownies, I do have a recipe for chewy gluten free brownies that even have that crackly top. I’ve found over the years that not all miniature muffin tins are created equal. Many of them have very shallow wells, which means they’ll never produce a beautiful shaped baked good. You want sloped (not entirely vertical) sides and a relatively deep well. After trying so many brands, the only one I reach for consistently is USA Pans. I have a mini muffin pan made by USA Pans, but it isn’t the one that Amazon.com carries. USA Pans also makes pans for Sur La Table and Williams Sonoma, so you might find it there as well. Dairy-free: Part of the reason that I wanted to create a video for this post and republish it was because I was determined to make it dairy free. And I succeeded! I used vegan butter (I’ve made the recipe using both Melt brand vegan butter and Miyoko’s Kitchen cultured vegan butter (now available at my local Trader Joe’s!)) in place of the butter. In place of the yogurt, I used plain So Delicious brand yogurt. Both substitutes worked great, but to get the proper thick, glossy consistency in the batter, I had to add 1 tablespoon of lukewarm water. Egg-free: I haven’t made this recipe egg-free, but you could try replacing the 2 eggs with 2 “chia eggs.” To make a “chia egg,” just combine 1 tablespoon ground white chia seeds with 1 tablespoon lukewarm water and allow it to sit. It should gel as it stands. Sugars: There are two types of granulated sugars in this recipe: granulated and light brown. They can’t be replaced with liquid sugars, but you should be able to replace each with its own specific sugar-free substitute. I’ve generally had success with Swerve brand. Keep in mind that sugar substitutes tend to be drying, so you’ll likely need to add some lukewarm water to the batter to create the proper consistency. Take a close look at the video to see the type of batter you need to achieve. Preheat your oven to 325°F. 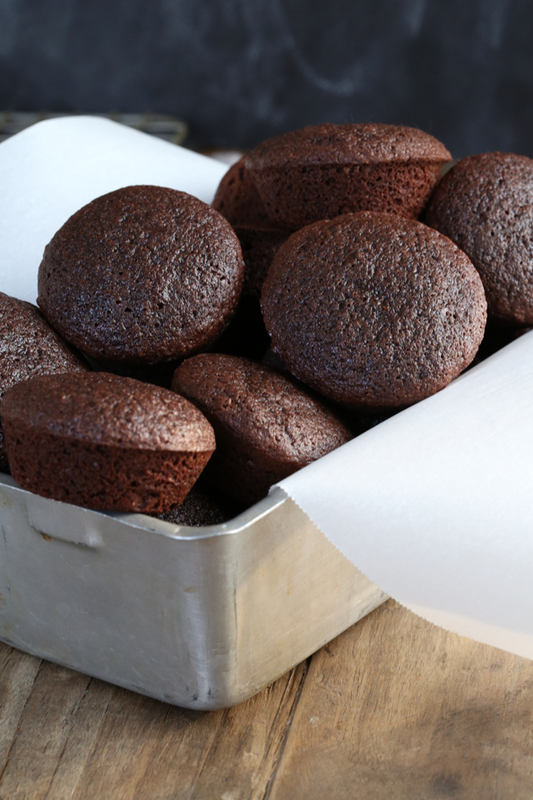 Grease a 24-cup miniature muffin pan and set it aside. In a large bowl, place the flour blend, xanthan gum, cocoa powder, granulated sugar, brown sugar, salt and baking soda, and whisk to combine well. Break up any lumps in the brown sugar, and create a well in the center of the dry ingredients. Into the well, place the melted butter, yogurt, eggs and vanilla, and mix to combine. The batter will be thick and glossy. 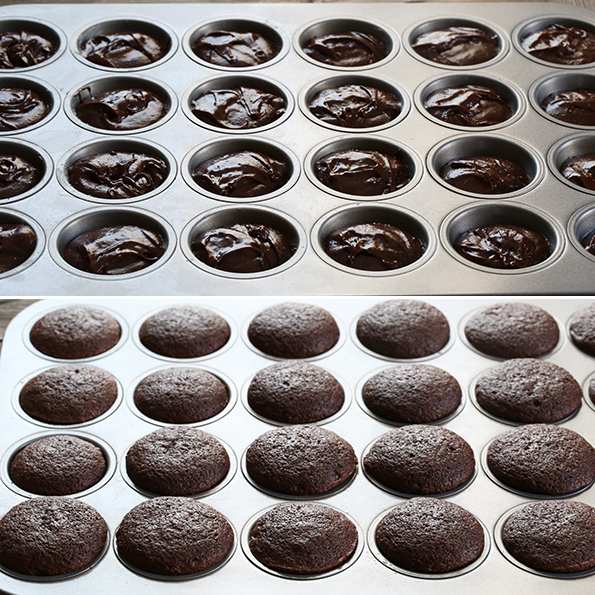 Divide the batter evenly among the 24 prepared muffin cups. Shake the muffin tin back and forth vigorously until the batter in each cup is smooth and even on top. Place the tin in the center of the preheated oven and bake until puffed and round, and a toothpick inserted in the center comes out clean (about 12 minutes). Remove from the oven and allow to cool in the muffin tin for 10 minutes before transferring to a wire rack to cool completely. Originally published on the blog in 2014. Recipe largely unchanged, some photos and video are new. Just made these exactly as written with your Mock Better Batter flour, and they are delicious! Just made them, delicious! Was given a package of Cloud9 all purpose flour and used 3/4 c flour and 1/4 c rice flour (white); used Greek yogurt and lactose free butter. They turned out great, top a little crunchy but like that. Will do a double batch next time and put some in the freezer, cause one batch will disappear quickly! Thanks Nicole. Hi, Teresa, If the sour cream isn’t too thick, it might work. You need the moisture. I’m afraid I haven’t tried though so you’ll have to experiment! I think you’re better off finding a recipe somewhere else, as gluten free recipes really are quite different from conventional ones, Addyson. Sorry! I used 2 12hole pans with sloped sides and deep. I only ended up with 23, suppose a little too full but not much. Mixed and measured exactly as written, including brand of flour. Took 5 minutes longer to bake before toothpick was clean. Cooled as specified. Ended up with 23 crunchy cookies (tops) and 23 cakey, moist little lumps. Would not stay together to get out of pan. Oven thermometer says 325. Disappointing. I live at 5000′ if that matters. You always have to make adjustments to baking recipes when you’re baking at high altitudes, Janice. That’s a condition that I can’t replicate, so I’m afraid I can’t offer specific advice but whatever you normal adjustments are, they should work. In addition, if you baked them in a dark-colored or glass muffin tin, they will cook much more quickly in certain areas. This recipe is one that I’ve made myself dozens of times and will work when made as written. A standard 12-cup muffin tin should work fine, Lynette. You’ll have to bake them a bit longer, but I’m honestly not sure if I’ve ever made them that way so I can’t be entirely sure how much longer. Can you add nuts to this RX? I think if you chop them relatively finely and don’t use too many, adding nuts should be okay, Tim. The mini muffins are on the larger side, though, so I’m not 100% sure if it would upset the balance of the recipe. I’m curious if you must cook them in muffin pans? Could you bake in a small baking pan? I’m in the process of moving and have already packed all my muffin pans. Yes, this recipe is made for a muffin tin. Try one of my other gluten free brownie recipes> for baking in a pan! Nicole, I am allergic to chocolate as well as gluten and dairy. Can I use carob powder instead of cocoa powder? Also, do you have any blonde brownie recipes? I have a blondie version of this recipe, actually, Cherie! Here it is. By “all purpose flour” do you mean plain flour and not self raising? And is “baking soda” bicarbonate of soda and not baking powder? The American names for things can be confusing! Sorry for being a pest! Hi, Elizabeth, All purpose flour is what you call plain flour. Baking soda is bicarbonate of soda. Hope that helps! Hi Nicole, have you any idea how many carbs there are in one of these please? They do look delicious 😋! Hi, Doreen, I don’t provide nutritional information for the most part. Feel free to plug the ingredients into your favorite online calculator. My favorite one is Cronometer. Is this recipe good for pan brownies? If not which of your recipes would you recommend? Hi, Lisa, no this recipe isn’t suitable for a single pan, like traditional brownies. Have a look around my gluten free brownies index for something that looks good to you! These are happening, tonight. Once dinner’s done in the oven, these will take up residence. We Canadians are actually able to buy a GF version of two-bite brownies in a large chain grocery store, but the price tag?!?! Only – and I do mean ONLY – when I’m the first to get to them on the 50% off bakery rack. And even then, I think of all the other things I can get with my $2.50 (that will last longer than a day!) I can bet all the ingredients here are way less than $2.50, and I’ll end up with more than a glorified dozen. Thank you, thank you, thank you!! i am going to try giving you a bit of a challenge here, seeing as how you are in the experimental mood! could you give us some recipes for those mini cake machines, mine will do 7 mini cakes (gift) and would save putting big oven on, tins, and all the rest! now that would be fantastic, any chance or have you run away screaming? i have, and come to you! I’m not sure what a mini cake machine is, shakti! Sorry! I made the batter exactly as directed, only I didn’t get a smooth, glossy batter… I got a lump at the bottom of my bowl. I added more yogurt and even a little milk to smooth it out. Fingers crossed that they come out OK, they’re baking right now (they smell delicious regardless LOL). Any ideas on what might have caused my dough to come out so dry? I measured everything by grams as indicated. I’d take a look at the flour that you used, Valerie. My guess is that is the problem. That, or your ingredients weren’t at the right temperature. If fat is cold, it will not incorporate into the batter. That could be. I use a different flour blend than you do, though I weighed it out and had exactly 140g… but with different flours, there are different absorption rates. I’ll try again with Better Batter (or your copycat recipe). I know I let the cold ingredients come to room temperature before beginning, so it’s most likely the flour. Thanks! Just ate 8 of these. If my husband doesn’t hurry home he will get none of these. So good! Didn’t have yogurt and so I replaced with applesauce. I don’t know what the yougurt does but I can tell you this. These were delish! These will be my go to treat. Thanks so much! I made a double batch of these last night. SOOOO good! They are a hit with the fam! Thank you, Nicole for all you do! I have just made these and they are amazing!! Thank you for making gf so tasty. If trying to do a dairy free version, what can I sub for the yogurt? Can I use almond milk? These look perfect….. I use fridge hardened coconut milk instead of the yogurt, but I have found using a single banana instead of a container of yogurt also works just as well. Fab, Leslie. Thanks for letting us all know! I was asked by a friend to make GF brownies for her pot luck wedding (2nd marriage). She is a brownie fanatic so they are doing tiers of brownies and putting bride and groom on top of them instead of a cake. Out of all your brownie recipes, which would you choose for a wedding pot luck? Has anyone tried the flax and ancient grain flour they now have at Costco’s ?? It probably wouldn’t work with any of the recipes we are so devoted to. If you’re talking about the cloud9 brand it works okay but Better Batter is better in terms of texture. I’ve only used it in cookies that I’m crushing for using in crusts though. I love your photos! What kind of camera do you use? Or you could use plain dairy free yogurt instead. I just made them. They are delicious! Thanks for another great recipe! What could you use in place of yogurt? Yogurt makes me sick so I never buy it but I see it in so many recipes. A nondairy yogurt should work fine, Hurley. Beyond that, I haven’t tested the recipe successfully other than as it is written. Feel free to experiment! The sour cream worked just fine…but I’m thinking that I might try vanilla yogurt next…. Thank you Nicole! These would be perfect for a 3 year old’s birthday treat for their daycare party. Not too difficult, nut and gluten free, and perfect for tiny hands. Yay! You’re the best! Can you use Greek yogurt or is it better to use regular? I use your brownie recipe from gluten free on a shoestring. I am also lactose intolerant so I use smart Balance tub butter instead of the butter and let me tell you in any of my circles they day brownies the only ones people request are mine! Lol. Thank you for your wonderful recipes. I love your cookbooks. I know exactly the packages you are talking about, because I walked into my Whole Foods yesterday only to be faced with a wall of them. Ugh. I briefly contemplated getting some and only having one, trying to trick myself into thinking I wouldn’t be in total agony, but…that would be idiotic. I’m SO glad I resisted and now have an alternative! I know the packages you are talking about. I also love the itty bitty scones that they have in the same tubs. I make a version of these brownies too and then pipe on a nice swirl of nutella cloud frosting on top. they are to die for and you know how I am about frosting!!!! Thanks for another great recipe! Do you use a regular size muffin pan or the mini muffin pan? I cannot wait to try! The recipe instructions specify a 24-cup mini muffin pan. looks like recipe says a 24 cup mini muffin pan! These look yummy! I may have to make them tonight… did you use large or XL eggs? I measure them by weight, April. I usually use extra-large, though. Thanks, Nicole! These look like the perfect lunch box treats, too. I’m thinking a double batch and the freezer…….